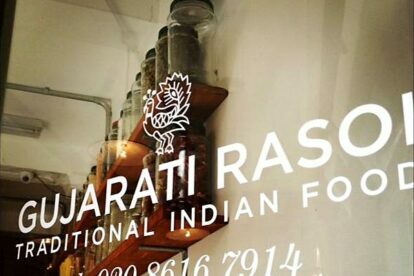 I have been a fan of the team behind Gujarati Rasoi since I discovered their stall on Broadway Market and had one of their perfect samosas. It was a revelation. None of the greasiness and/or blandness that often comes with a samosa. I had to go back and pick up four more to have at home with a nice cuppa! Thankfully the stall still exists but now there is also a small vegetarian restaurant in Dalston and it manages to keep up the high standards. First things first: this isn’t a cheap vegetarian option. At £13 for a main this is perhaps even a touch overpriced for what you get, but what you get is incredibly tasty. Last time I went I had the Ringan Burthu (baked aubergine with coriander that comes with a paratha) followed by the Palak Paneer (paneer with spinach served with a fantastic dhal and cumin rice) with the Thepla (fenugreek flat bread). It was all great. Spicy rather than hot. Full of flavour rather than just heat. Word is spreading (as this review shows) but thankfully so is the restaurant – as they have now knocked through into next door and almost doubled in size. It is still small, but I like the atmosphere that it induces. Busy and buzzy. If you go I recommend popping next door to Servant Jazz Quarters – it’s part speakeasy, part Art Deco cocktail lounge, part jazz venue and part Dalston hipster hangout … (well, of course, it is).